If you haven’t heard of exfoliating your lips before – you are not alone. When it comes to your lips, we often give more importance to hydrating them. But here’s the thing – you do need to exfoliate your lips regularly to maintain a healthy, smooth pout. Blame it on that frigid weather, but when your lips get dry and chapped, they tend to flake and peel – a lip scrub helps to slough off dead, chapped skin and helps your lip balm penetrate deeper into the skin. The result? Supple, rosier and healthier lips. 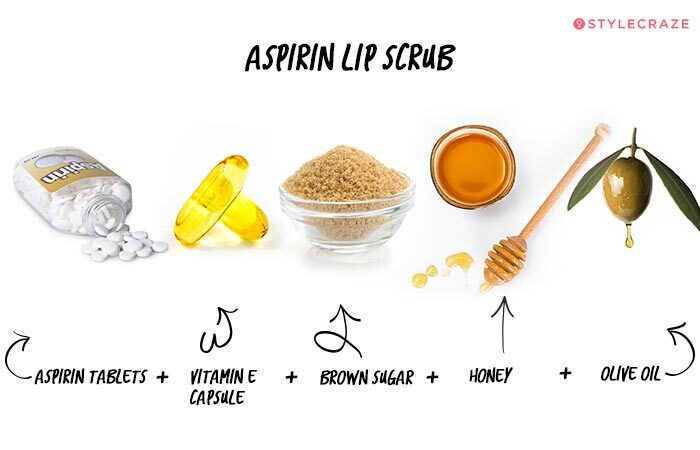 You don’t have to spend a fortune on purchasing expensive scrubs from the market when you can simply make a lip scrub at home with a few ingredients that you’ll easily find in your kitchen cabinet. 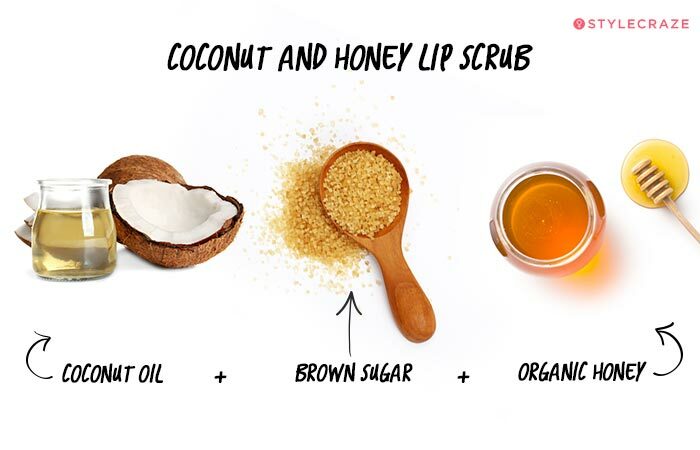 Read on to find some amazing DIY homemade lip scrub recipes. A lip scrub contains two components: an exfoliant and a nourishing agent. The emollient or the nourishing agent provides a hydrating base for your exfoliator, making it easier to apply to your lips. These two go hand in hand for moisturizing and smoothing out your lips. We’ve got 18 DIY homemade lip scrub recipes sans the gross chemicals. Pucker up! Just a heads up – some of these are so delicious, you might want to eat them! But don’t do that! 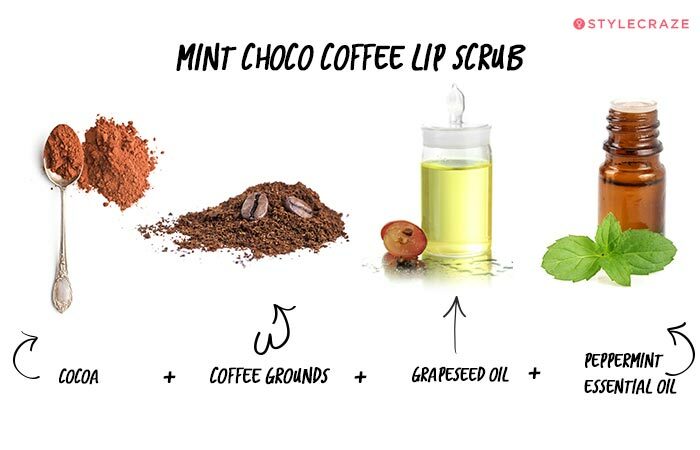 Here’s how you can make and use these delightful lip scrubs. Start by mixing the coconut oil and honey. Add the brown sugar and the lukewarm water to this mixture. Rub the mixture on your lips in a circular motion for two to three minutes and then rinse with lukewarm water. Coconut oil is filled with antioxidants and fatty acids that nourish the skin, while the brown sugar acts as a natural exfoliator that helps remove dead, dry skin. Honey is rich in natural healing properties. Mix the sugar with your chosen emollient. Add 8-10 drops of peppermint oil and blend. Alternatively, you can use spearmint essential oil. Add grapeseed oil to the mixture. Apply the scrub to your lips and rub it in circular motions for a few minutes. 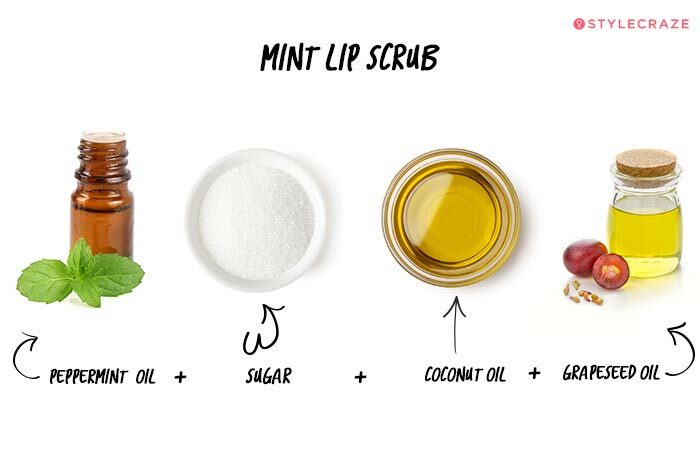 Sugar works as a natural exfoliant while peppermint oil helps to stimulate circulation under the lips and create a “just bitten” effect that makes your lips appear fuller. 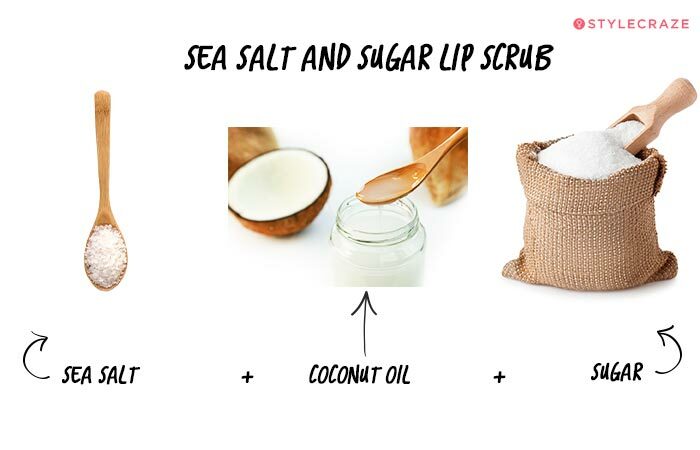 This DIY sugar lip scrub is also very soothing and refreshing for the skin on your lips. Grapeseed oil is lightweight; it’s filled with antioxidants and acts as a wonderful natural moisturizer for your lips. Mix the brown sugar with raw honey. Add a few drops of lavender essential oil to this mixture. 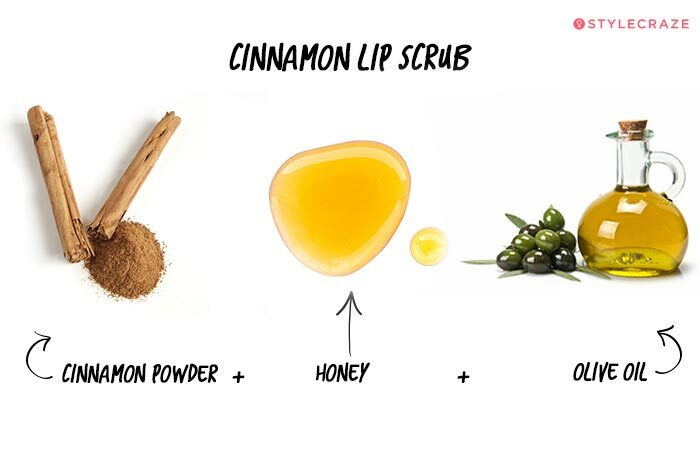 Once blended, apply the scrub to your lips and rub it well in circular motions for two to three minutes. Wash with lukewarm water and apply some lip balm. 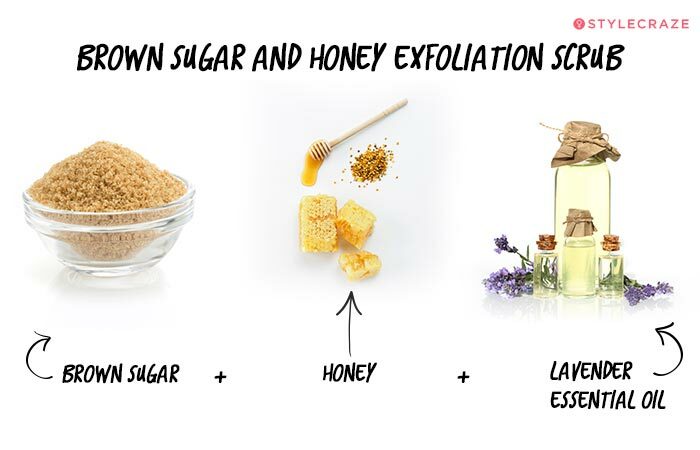 This is one of the best homemade sugar lip scrubs. Raw honey works well to lighten your lips. It also helps get rid of chapped skin, so your lips appear brighter than before. Lavender oil deeply nourishes your lips and is excellent for preventing sunburns on your delicate pout. Apply a small amount of the scrub to your lips and rub it in gentle circular motions. Allow the mask to sit on your lips for a couple of minutes. Wipe off with a soft wet cloth or wash with lukewarm water. 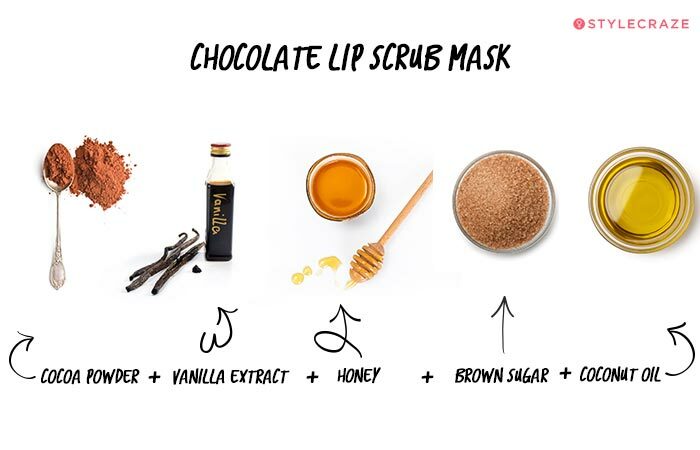 This homemade lip scrub mask not only satisfies your chocolate cravings but the cocoa helps moisturize your lips deeply and removes tan. Vanilla extract has a whole bundle of anti-aging benefits and antioxidants that prevent and reverse skin damage caused by free radicals. Combine the ingredients in a mixing bowl. Apply the scrub using your fingertips and gently slough off the dead skin cells. Cinnamon is a natural lip plumper, so if you want that Kylie Jenner pout without the lip injections, this scrub is a foolproof technique to achieve that. Cinnamon also acts as a natural exfoliator and helps you achieve smooth, soft lips instantly. Grind your dried orange peel to make a fine powder. Add brown sugar and almond oil to the powder and mix the ingredients in a bowl. Gently scrub this mixture on your lips for about 30 seconds. Clean your lips with a wet wipe or wash with warm water. 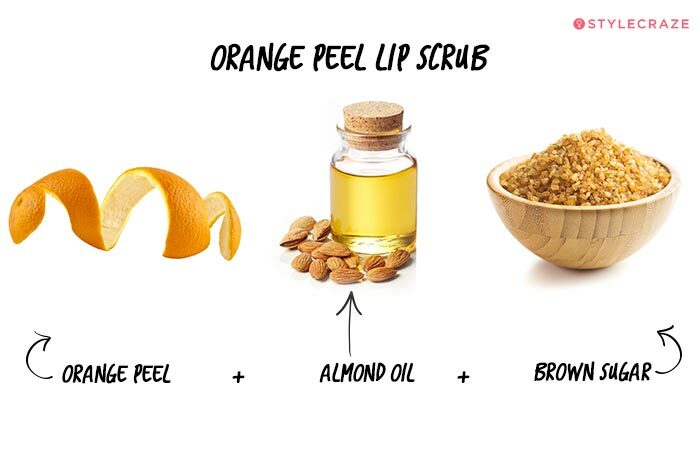 The orange peel present in this DIY lip scrub recipe is excellent for treating dark and discolored lips. 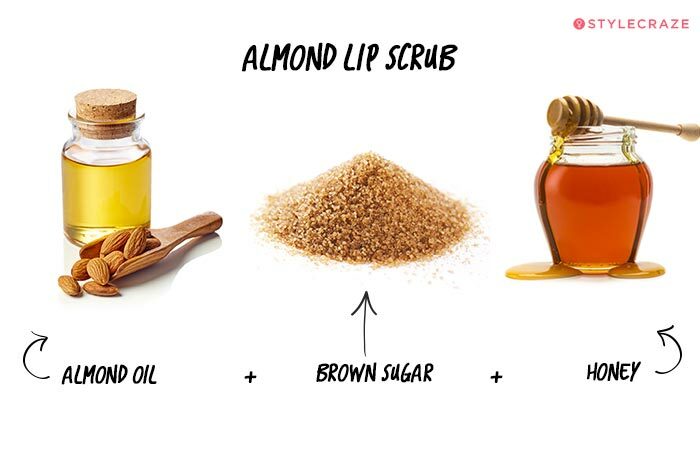 Almond oil helps nourish and moisturize dry, chapped lips while sugar is a natural exfoliator for healthy lips. Mix the sugar and olive oil in a blending bowl. Add the strawberry extract into the mixture and blend well. Add a few drops of your food color according to your preference and stir well. Apply this scrub with a clean finger, and let the exfoliating sugar scrub away any dead skin. Follow with a lip balm. 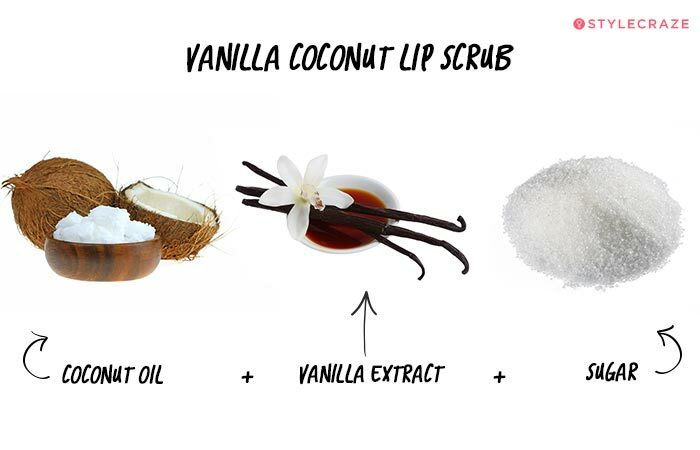 This delicious lip scrub is a sweet treat for your pout. The sugar removes dead skin cells to reveal healthy skin underneath. Extra virgin olive oil hydrates and seals moisture into your lips. The color part is only to make this bubblegum lip scrub as attractive as it’s tasty. Puree your strawberry and kiwi in a blender and set aside. Add the sugar and olive oil in a small bowl. Stir the mixture until it’s well blended. Add the pureed fruits to the mixture and stir well. Add the vitamin E for extra nourishment. Apply the cool scrub in a circular motion for 30-40 seconds and allow the sugar to exfoliate any dry skin. 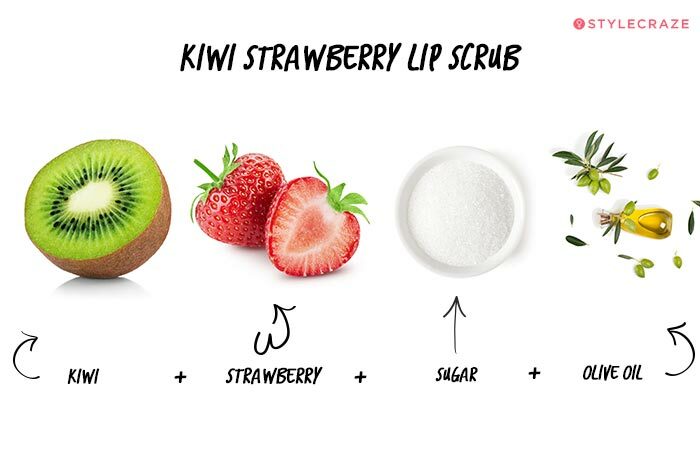 This refreshing lip scrub for dry lips is an inexpensive way to moisturize and nourish your lips with fresh fruit. Kiwi helps to soothe sore and dry lips and makes them softer and more supple. Strawberries contain vital minerals and vitamins that help treat discolored lips. Mix the coffee grounds and honey in a mixing bowl and stir well. Dab this scrub onto your lips and massage in a circular motion for about one minute. Leave it on as a mask for another minute. Wash away with warm water for instantly hydrated lips. Coffee isn’t just for waking you up in the mornings. It’s a secret weapon that you can use on your skin and lips to keep them looking healthy and happy. 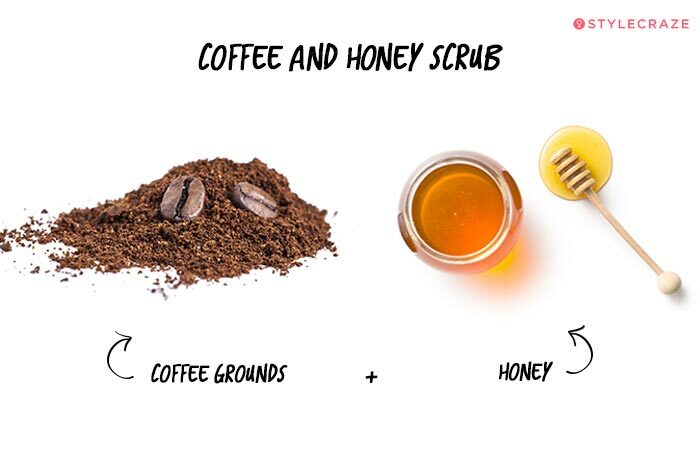 This combo of coffee grounds and honey is a reliable way to exfoliate and moisturize your lips. Stir well until properly blended. Gently rub a small amount to your lips. Lightly rinse to take off the sugar, but leave a little almond oil on for hydration. Almond oil helps to rejuvenate dead cells and prevents further chapping of lips. 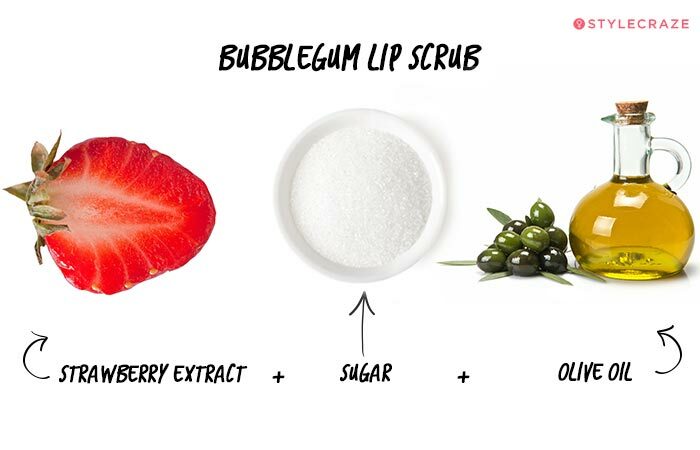 You can use this scrub on a regular basis for healthy, rosy lips. 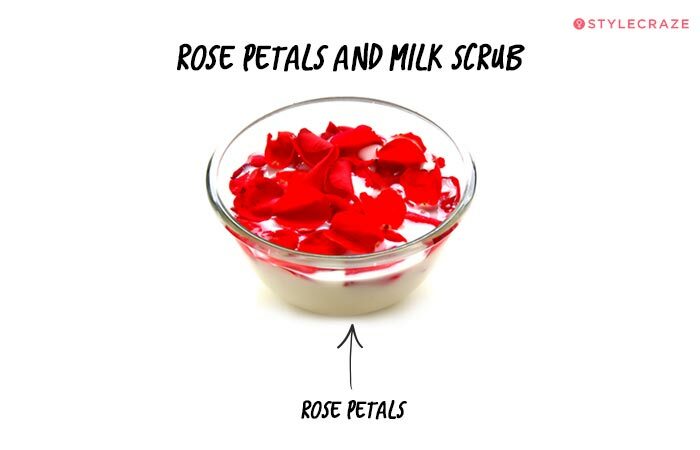 Take petals from one rose and mash them well together in milk to achieve a paste-like consistency. Rub this onto your lips like a regular lip scrub. Rose petals help in naturally lightening the tone of discolored lips. Its antibacterial properties also help in protecting your lips. Cold milk helps in brightening your lips. Take your sugar and mix it with the petroleum jelly (original Vaseline) in a mixing bowl. Add the lemon juice to this mixture. Wipe it off with a wet wipe or wash with lukewarm water for bright, supple lips. Lemon juice acts as a natural bleaching agent. This scrub helps exfoliate dead cells so new, fresh skin is revealed. Mix the sugar, coconut oil, and vanilla extract in a mixing bowl. Take a small amount and massage it onto your lips for a minute. Coconut oil helps soothe chapped lips and deeply moisturizes them. Sugar helps exfoliate dry and dead skin while vanilla extract helps heal sunburns. Mix your ingredients in a bowl until everything is well blended. Apply the scrub by rubbing your lips with a clean finger in a circular motion. Follow with a lip balm to lock in moisture. Vitamin E is a natural conditioner and antioxidant. It treats chapped and irritated lips instantly. Mix the sugar, cocoa, and coffee grounds together in a bowl. Add your grapeseed oil and peppermint oil to this mixture and blend it until you achieve your desired consistency. Dab some onto your lips and scrub for a minute. This scrub consists the goodness of cocoa, coffee, and sugar. These natural exfoliators slough off dead skin with ease and nourish your lips from deep within. Grapeseed oil helps moisturize and hydrate them. In a clean bowl, add your aspirin and a few drops of water to break them down. Add the rest of the ingredients, mix well, and if the consistency is still dry, add some more oil. 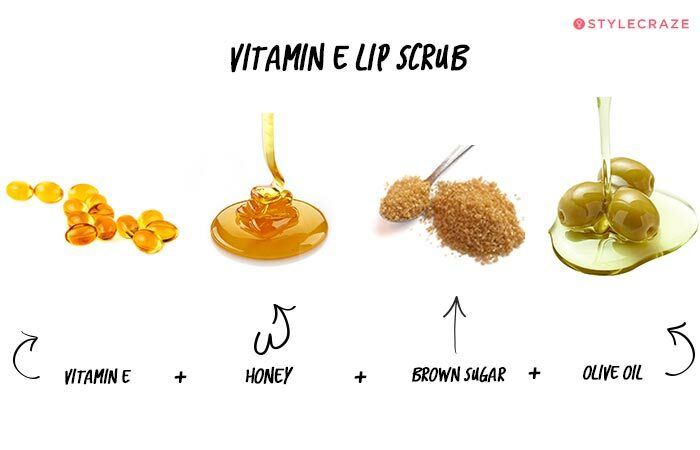 Use your finger or a toothbrush to apply the scrub to your lips. Aspirin is an acetyl derivative of Salicylic Acid. When you combine it with sugar, it helps give you intense exfoliation. Honey and olive oil, on the other hand, moisturize your lips. 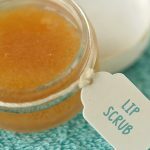 This is the best homemade lip scrub to treat dryness in lips. Apply generously to your lips and scrub it in circular motions, keeping your lips closed. Sea salt works as a great exfoliant and coconut oil is an excellent moisturizer. 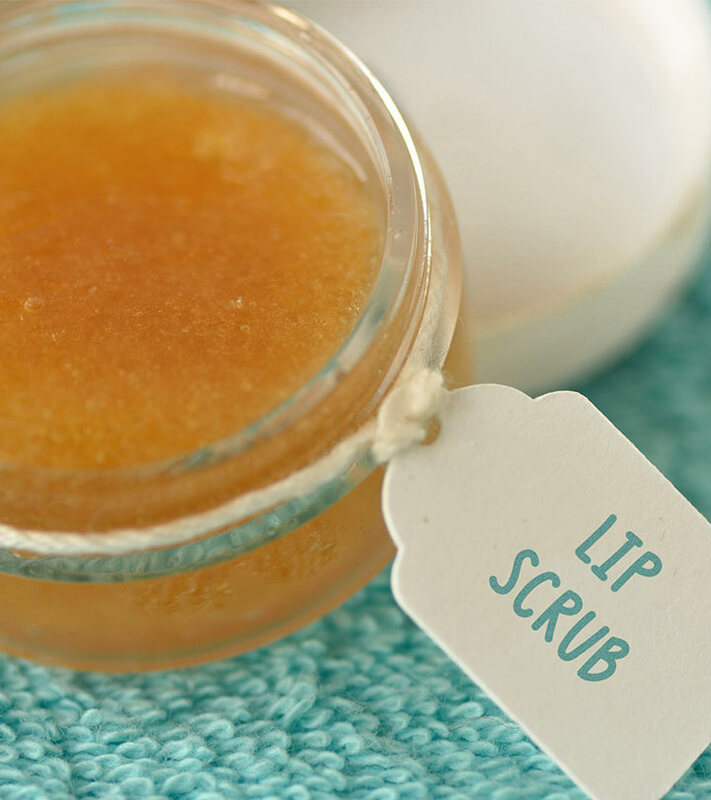 This homemade exfoliating lip scrub will leave you with rosy lips in no time. Mix the shea butter with sugar till you get the desired consistency. Apply generously all over your lips and scrub for one minute. Shea butter contains vitamins A and E, both of which moisturize and soothe chapped lips and dryness. 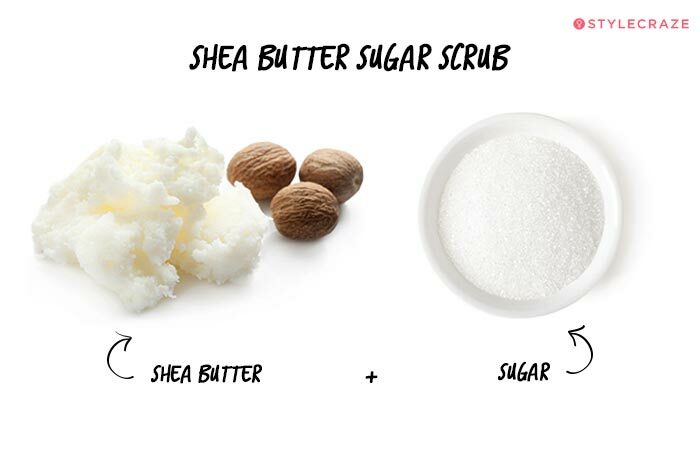 Sugar acts as the perfect natural exfoliator to go with the shea butter. It’s always advisable to make your homemade lip scrubs in small batches. They will remain fresh and last you for about a week. Store your scrub in a clean and dry, old lip balm or eyeshadow case. Sterilizing the container by leaving it in hot water for a while is recommended to prevent germs. Refrigerate this case and use it within a week. 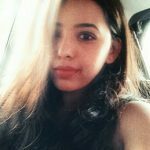 Your smile isn’t all about your pearly whites; it’s about your lips as well! You don’t need to hurt your pockets by buying expensive lip scrubs from the store when it’s so simple to make your own at home! 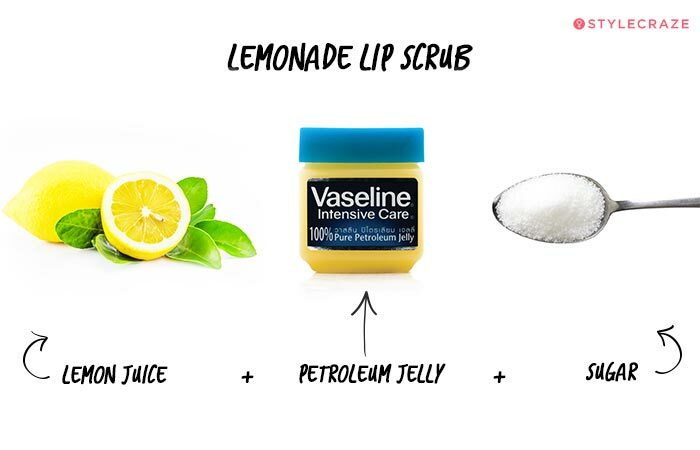 Have you ever tried any of these DIY lip scrubs? Which homemade lip scrub is your favorite? Let us know in the comments section below.